3.50 grams (one teaspoon) of dried herb cover with 3 glasses or 1 liter of boiling, non chlorine, water (distilled preferred), let it boil on the low heat for 3-7 minutes with a lid on. Pour everything into a thermos and leave it overnight - lid on. Strain in the morning and drink 1 glass 3 x day between meals (one hour before or after meal). (Bixa orellana); "ANNATTO", ”Achote”, “Achote amarillo”, "Lipstick Tree", "Bija", "Urucum", "Bixaceae", Annato Family - Cultivated. Natives use it for food coloring and to decorate their bodies. There are experimental plots for the extraction of bixin. In North part of Peru, the shoot decoction is considered anti-dysenteric, anti-septic, anti-venereal, aphrodisiac, astringent, febrifugal. Seeds believed to be expectorant, the roots, digestive, anti-tussive. Leaves are used to treat skin problems, poultice leaves to eliminate scars, hepatitis, aphrodisiac, anti-dysenteric, anti-pyretic. 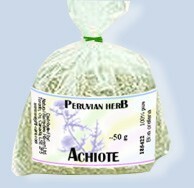 Achiote is considered beneficial and healing for the digestive system, liver disease, kidney diseases, urinary problems, prostate cancer. Effective as a gargle for tonsillitis problems. Flowers are used in infusion as purge and to avoid phlegm in newborn babies. ”Kayapo" massage stomachs of women in labor with the leaves. ”Kayapo” use it as a body tint. 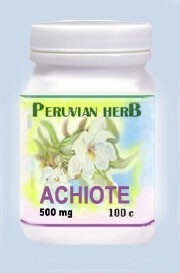 It is said to be an antidote for HCN poison. Around Explorama fresh leaf stalks, devoid of blades, are inserted into a glass of water; the mucilage that forms is applied in conjunctivitis. The decoction made of leaves, bark, or seeds of the plant is used by the indigenous tribes of Amazon to speed up healing of wounds or burns. Orally applied preparations are considered to stimulate digestion. Fresh seeds can be eaten due to their nutritional value.